Quick and easy Thanksgiving turkey stuffing recipe, made with simple ingredients in one pot on stovetop. This 30 minute side dish is loaded with butter and herbs. 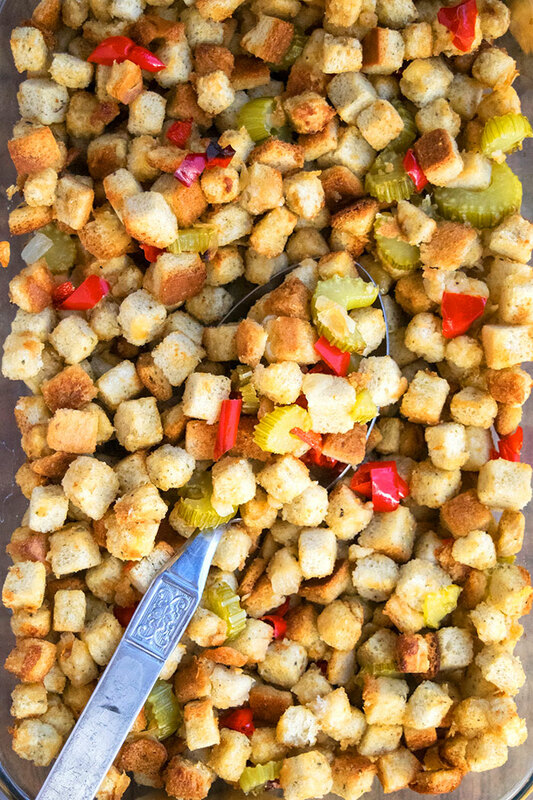 This is the best turkey stuffing recipe ever with the perfect texture! Stuffing should be moist and loosely sticking together and NOT sticking together into a soggy “mushy” paste. Dried bread is used because it absorbs a lot of moisture and flavor and creates the best texture. This one pot easy turkey stuffing is ready in less than 30 minutes! How to make turkey stuffing from scratch? How do you make homemade turkey stuffing/ Homemade stuffing for turkey? How do you make traditional stuffing? Saute onion, garlic, celery, red peppers in butter. Add dried herbs and broth and bring to a boil. Turn off heat, cover and allow the breads to absorb the moisture. 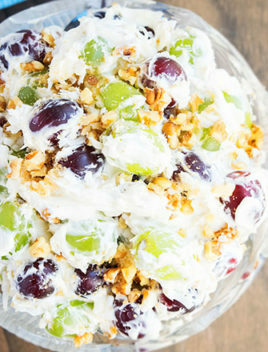 Fluff with a fork, prior to serving and you are done. What is the best stuffing for turkey? My recipe below is the best! 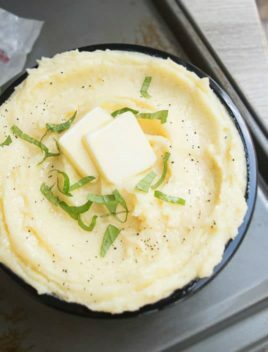 It’s classic and traditional and loaded with herbs, butter, onion and celery. It’s moist but still firm. How to stuff a turkey? Spoon the prepared stuffing mixture inside the turkey’s cavity. DON’T tightly pack it in because that will make the too soggy. The rule of thumb is you need about 3/4 cups of stuffing per 1 pound of turkey. This should be done just prior to baking the turkey or else bacteria can grow. There is a huge debate surrounding this issue. 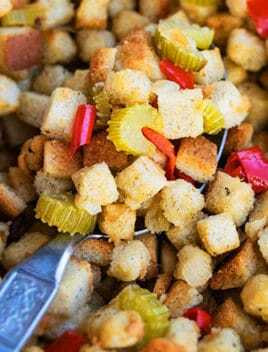 My family always served this bread stuffing on the side but I did some research and found that if you stuff a turkey with stuffing, you have to use a long thermometer to ensure that the center of the stuffing cooks to 165 degrees. Only at that temperature, the stuffing is considered safe for consumption. Check out the USDA’s detailed safety guidelines for stuffing turkey. That being said, I don’t like stuffing cooked inside a turkey because it becomes very soft and moist and almost soggy. I prefer my stuffing a little firmer and cooking on the side on stovetop ensures that it’s not too soft. What spices do you put in thanksgiving stuffing? Instead of all these herbs, you can use a few teaspoons of Italian spice mix or poultry seasoning mix. What do you put inside the turkey? Some people add the prepared stuffing inside the turkey. Other people add a combination of oranges, lemons, onions and fresh herbs instead of the stuffing. This basic turkey stuffing requires simple ingredients! You have to use dry bread because that allows it to absorb all the flavors from the spiced broth. 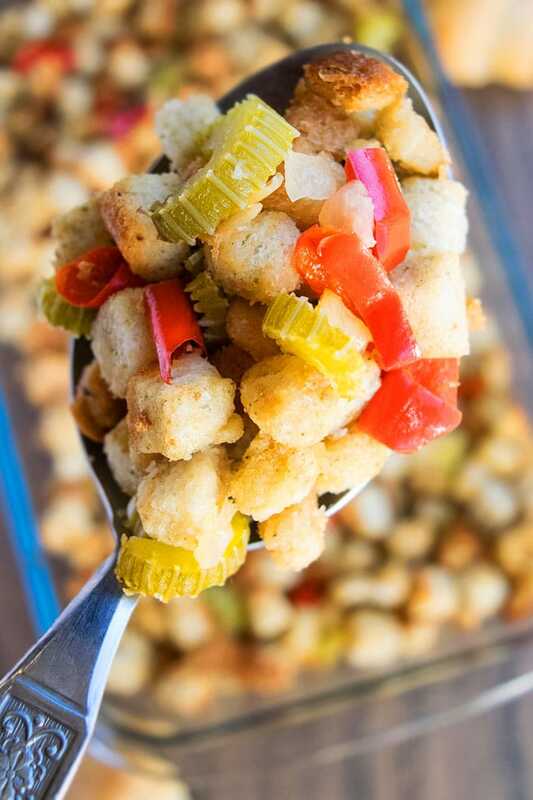 Use gluten free bread cubes or croutons. The rest of the recipe is exactly the same. How to make dried bread cubes? I usually buy them because it’s quick, easy, cheap and a time-saver. However, they can be made at home too. Cut fresh white sandwich bread (or any other bread of your choice) into 1 inch cubes and put them in a large bowl. Let the bread cubes sit at room temperature, uncovered, away from any moisture for 48 hours so they dry out and become stale. Toss them once or twice a day so that they dry evenly. They don’t have to be crispy dry. Place 8- 10 slices of white sandwich bread evenly on a sheet pan and toast in the oven at 350 degrees for 8-10 minutes or until golden brown. Then, flip the slices and toast the other side until golden brown. This takes about 5-6 minutes. Remove the bread from the pan and cut into into 1/2 inch- 1 inch cubes. Add some red chili flakes and paprika. You can also add some spicy sausage. Use whatever sausage you like. Cook it with the vegetables. Then, add herbs and broth. Mix in the dried bread and you are done. This is an awesome way to use up leftover stuffing. It helps to bind the meatballs together like glue and also adds flavor from all the spices and herbs that were added in the stuffing. This is another great way to use up leftover stuffing. It helps to bind the meatloaf together like glue and also adds flavor. Use leftovers in a casserole the next day with shredded turkey, roasted vegetables, mashed potatoes and lots of cheese. You can use this stuffing for roasted chicken too. It works great with Italian chicken and Greek chicken. Once again, I prefer serving the stuffing on the side rather than putting it inside the chicken but it’s a personal choice. Use this recipe for Christmas turkey stuffing too! Use low sodium broth and unsalted butter to prevent this stuffing from becoming too salty. This is optional: Transfer the stuffing to an oven-safe dish and bake uncovered at 350 degrees for 15-20 minutes to make it a little toasty and crispy on the top. 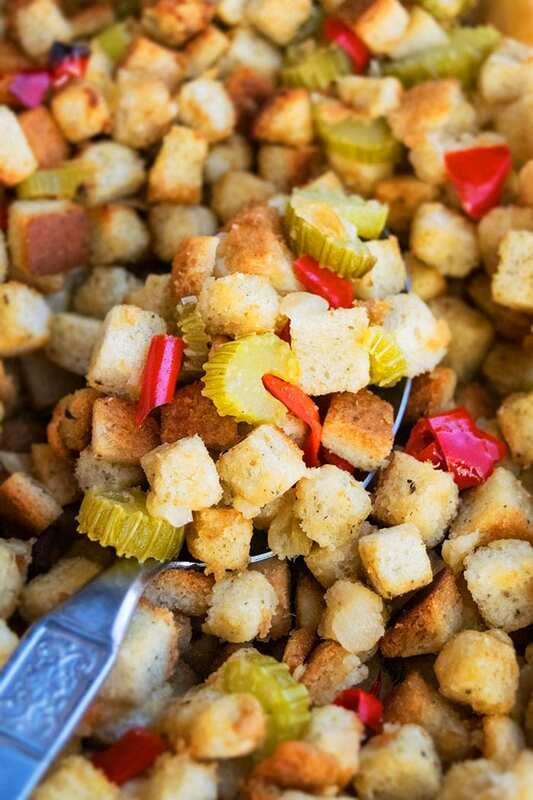 If the stuffing is too dry and crumbly, add more broth and toss gently until it starts to clump together. Please remember that it takes some time for the liquid to get absorbed in the dried bread cubes. DON’T RUSH! Wait for a few minutes before adding more broth. Only add a little at a time because this will prevent it from becoming soggy. The amount of herbs can be adjusted, based on your preference. 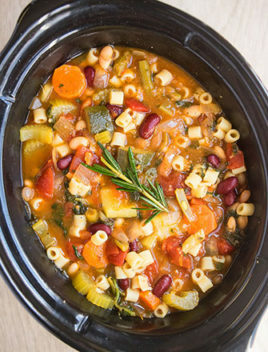 To make this recipe suitable for vegetarians, use vegetable broth. 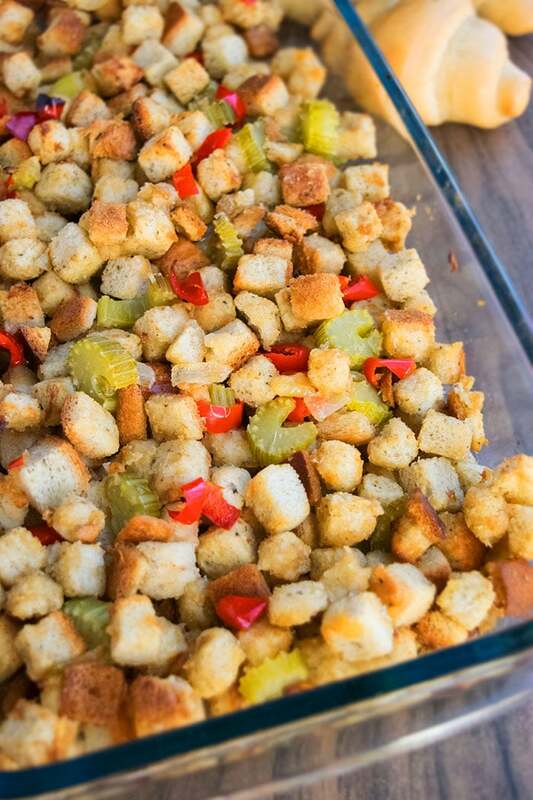 Quick and easy Thanksgiving turkey stuffing recipe, made with simple ingredients in one pot. This 30 minute side dish is loaded with butter and herbs. 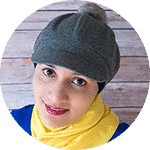 In a large nonstick pot, add butter, onion, garlic, celery, red peppers and cook on medium high heat until vegetables are softened and onion becomes translucent. This takes about 5-6 minutes. Add dried parsley, sage, oregano, marjoram, thyme, salt, pepper, broth. Mix and bring to a boil. Mix in the croutons or bread cubes to this seasoned liquid. Remove from heat. Cover and let the stuffing sit for 5 minutes so that the bread absorbs all the liquid. If you prefer a softer stuffing, add more broth (1/4 cup at a time) and let it sit again for 5 minutes. My mom likes to use a fork fluff the mixture, prior to serving but I like the whole bread cubes and don't do this. It's a personal preference. Enjoy! 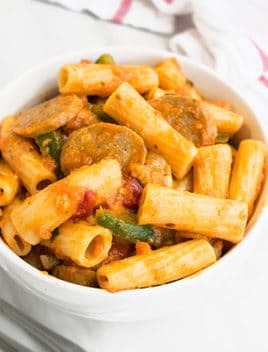 Tastes best when served fresh but leftovers can be stored in a sealed container in the fridge for up to 2 days and reheated in the oven or microwave. I love how easy this stuffing recipe is! It looks so delicious! I love how simple this is! Can’t wait to stuff my face with it on Thanksgiving! Yummmm!